Generally, I am not one to find escape in music, but conductor Gianluca Capuano’s reading of Gluck’s elegant score soothes and restores. As a complement, Robert Carsen’s production, updated to the modern day, reflects upon the universality encompassed in this ancient myth of inconsolable grief, fathomless love and benevolent gods. A few years ago, empty stages with massive tables masquerading as sets were encountered regularly in European opera productions. Now the trend in Europe and the US is for bare mounds and little else. (This is my fourth in recent months.) Carsen followed suit in Orfeo, creating a bleak and barren gravelly hill, suggestive of volcanic terrain, devoid of all vegetation. When the curtain rises, you are immediately transported to one of those places at the end of the world, where the veil between human existence and the supernatural is easily pierced. Euridice’s freshly dug grave is off to the side. It will later serve as the porthole to the underworld, where the gray mound becomes the preserve of the dead. Dark and gloom prevailed, the gray backdrop occasionally brightened by a progression of muted, monochromatic washes of green, yellow or orange. Light comes only at the end when grief and death have been vanquished, when even the house is illuminated. It was too jarring, sort of tacky, and the only misstep of Carsen’s concept. Lighted bowls are the only props, save for the knife with which Orfeo twice tries unsuccessfully to kill himself. A single bowl is placed near Euridice’s grave in the opening scene, while the Furies shrouded in white are encircled by them in the underworld. Later, in Elysium, Orfeo and the Furies engage in a hypnotic, dance-like rite with the bowls, prior to his being reunited with Euridice. Cast and chorus are dressed in unadorned black. At the very end, Amore wraps one of the white shrouds around her as a stole, signifying her smug satisfaction with the role she played in reuniting the couple. Capuano specializes in historically informed performance practice. Informed is the operative word as exemplified in this performance of the 1762 Vienna version of the opera. The musical delights were many and varied: the bowing of the strings and their delicate pizzicati underpinned by the harpsichord, Orfeo playing his lute rendered by the harp, and the horns adding emotional weight to every scene in which they played. (It was great fun hearing them warm up in unison and tune prior to the overture.) Yet it was Capuano’s command of dynamics, tempi and articulation that permitted the music to create the profound depth of emotion. Carlo Vistoli’s opening cries of ‘Euridice’ were heartbreaking, as was the remarkable vocal flourish with which he adorned a single word – ‘Vieni!’ – as he pleaded with Euridice to follow him. The countertenor is handsome and virile in both countenance and voice; his natural ease on stage was at one with the starkness of Carsen’s concept. There were virtuosic vocal displays, but it was the intensity of feeling and the sense of line in his singing that elevated it to another level. Mariangela Sicilia brought a more operatic-scaled soprano to Euridice, apparent in the quality of her sound rather than in volume. She was also a compelling actor: her death in Vistoli’s arms was almost too painful to watch. As Amore, Emőke Baráth’s light, clear soprano was effervescent. Amore has her serious moments, but it is the joy with which Baráth sang that I remember. The chorus’s shouts of ‘No! No!’ as Orfeo pleads with them to let him enter Hades to find Euridice were as startling as the penetrating cries of Orfeo. Carsen required the ensemble to carry as much emotional weight as any of the three principals, impersonating mourners numb with grief, the dead to life stirred to life and mercy and, ultimately, singing and dancing with abandon in the finale. 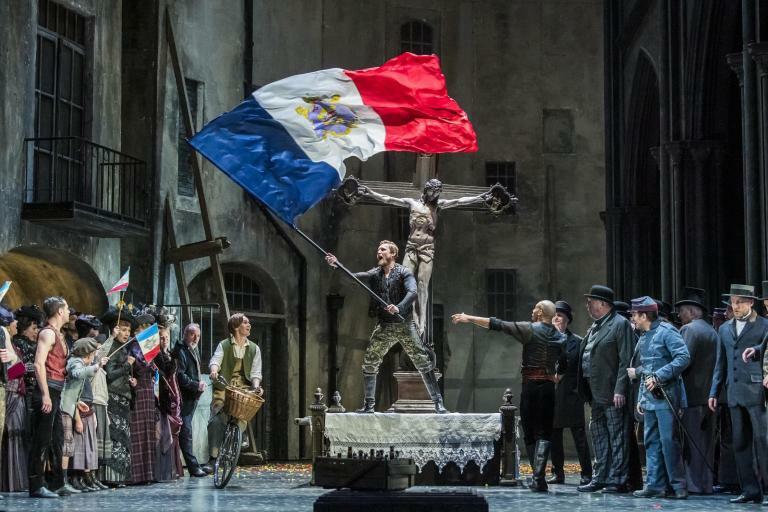 Carsen’s staging (a co-production with Théâtre des Champs-Elysées, Château de Versailles Spectacles and Canadian Opera Company) will be well-traveled and undoubtedly faithfully reproduced, but whether it will be as powerful as here is anyone’s guess. The Rome Opera set a very high mark for the music values in this extraordinary performance, one that will be hard to replicate.